Michell Instrument’s newly launched Easidew PRO XP explosion proof dew-point transmitter is now available with an optional integral display, for improved ease of use. The local display provides engineers with readings of moisture at the point of installation, enabling them to carry out checks and make adjustments conveniently and quickly without referring to their control room. 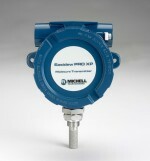 The Easidew PRO XP with display is capable of measuring moisture in both gases and non-polar liquids. The transmitter is housed in a tough, explosion-proof epoxy coated aluminium casing as standard, however, an alternative 316 Stainless steel casing, rated to IP66/NEMA 4, is available for offshore applications. This versatility makes it an ideal option for systems integrators as they only need to stock one dew-point transmitter for all moisture measurement applications in hazardous areas. The Easidew PRO XP moisture transmitter uses latest ceramic moisture sensing technology from Michell, and is capable of measuring dew points in gases from -110°C to +20°C and 0-3000 pppmV. In liquids the measurement range is from 0-3000 ppmW. With a 450 bar (6527 psi) pressure rating, EN10204 3.1 material certified parts and NPL/NIST 13-point calibration certificate, it meets all the current demand of the process industry. As part of their continuing programme of global certifications and pattern approvals, Michell has recently gained full Canadian CRN approvals and INMETRO approval for Brazil for the Easidew PRO XP. This is in addition to the certifications from ATEX, CSA and IECEx – making it acceptable in hazardous areas world-wide. Michell is working to gain futher certifications to further enhance its global acceptance.